Some places have a magical draw on our souls. Munich is one such place. Whenever I find myself in Germany, or central Europe for that matter, I am always tempted to hop a train, or drive down the autobahn to Munich. Known as München to the locals, tis city has the heart of a village, but the energy of a large metropolitan area. It is filled with life and passion. The best way to get to Munich is by train. The central train station or Hauptbahnhof is located just off the center of town. The stroll from the train station to the highlights of the city is casual and easy to find, even on your own. From the train station head to Karlsplatz. 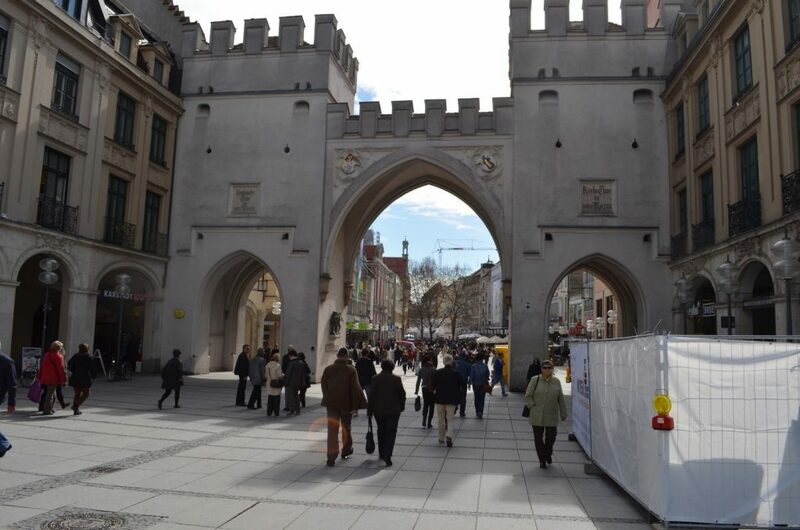 Karlsplatz is one of the gates to the old city of Munich and has the castle like entrance to prove it. A beautiful fountain, used for ice skating in the winter months, guards the entrance and the shops at Karlsplatz. From Karlsplatz stroll down the pedestrian only Neuhauser Strasse to Marienplatz. This stroll will take you down between the shops that line this wide pedestrian road. In the summer you can buy fresh strawberries or cherries and in the winter, you can buy hot chestnuts that are roasted on the spot. This is the heart of Munich and you will always find a crowd of locals hanging out, shopping, and eating. Along the way, take some time and wonder into the Frauenkirche. This twin towered Cathedral is an amazing place, with its huge crucifix with a larger than life Jesus hanging there, walk around, enjoy the enclaves around the edges and soak in the history. 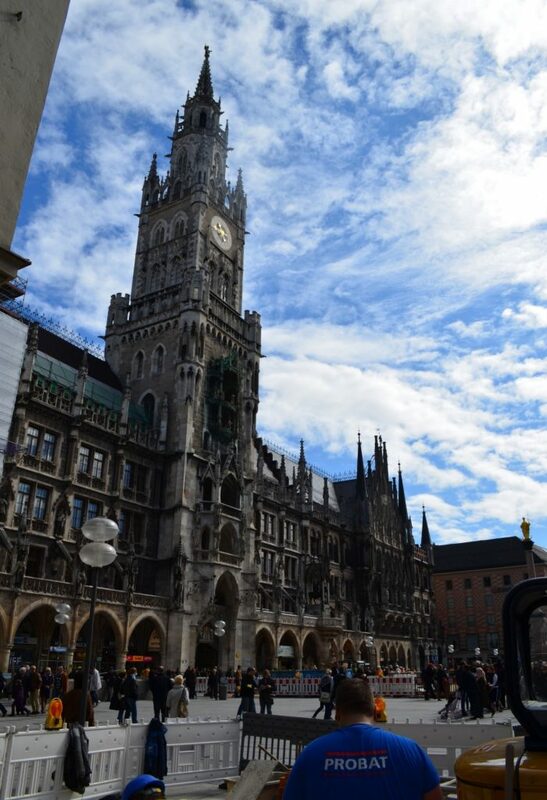 At Marienplatz you are looking at the city hall complete with its dancing Glockenspiel. The Glockenspiel features jousting knights a couple of times a day in a music laden display that draws crowds throughout the day. This is the emotional center of Munich. Crowds of people are never far away, especially during the two times of the day when the Glockenspiel comes to life and dances for you. Restaurants, with outdoor serving areas sit across the way from the Glockenspiel, so sit down, order a hearty Bavarian meal and watch the sights. This plaza is a great place to base yourself out of for the day. Just around the corner is St. Peter’s Cathedral. Pay a few euros and climb to the top of the tower. The spiral stair case is tight and not for the faint of heart. Those going up have to watch out for those coming down. It is easy to see, when climbing towers like this, that Germany does not have tort liability. They are not worried that someone might get hurt. There is also no way up for handicapped people, no elevators, only stairs. From the top is a beautiful view of the area, looking directly across to the Toy Museum and the Rathaus or central government building. The balcony of this tower gives a 360° view of the city from the center of the city, it is well worth the effort to get to the top. Across the street from the entrance to the tower is an old souvenir shop in a building that has been there since the 16th Century. It is worth a stop as it has nice pewter ornaments for Christmas trees or the walls of your home. I have three hanging around my office in my home. They have complete compliment of general souvenirs as well. Plus, there is nothing like shopping in an historic building. When you finish shopping come out of the store turn to your right and walk down a block to the Viktualienmarkt. This is a local farmers market with shops that sell prepared food along side booths that sell fresh grown produce. It is a great place to see how the locals live, even in a big city far removed from the farm. Enjoy a bratwurst while sitting underneath the May Pole that decorates the market. Sit back and watch the citizens of Munich come and go in this bustling area. A few blocks away from the Glockenspiel is the Hofbräuhaus. This old beer hall still functions like it did over a hundred years ago. It is across the street from the Hard Rock Café and well worth the time and energy to go inside, look around, and enjoy a traditional Bavarian beer hall meal of sausages or chicken and potatoes, or try the local specialty spätzle, complete with a liter of beer. You can order the half liter if you are not a big beer drinker. Remember, this is Munich and beer drinking seems to be the national pastime here. My favorite drink in all of Germany is the rädler. This is a drink that is half beer and half lemonade. The Hofbräuhaus serves one of the best rädlers anywhere. My advice is to make an evening of it. 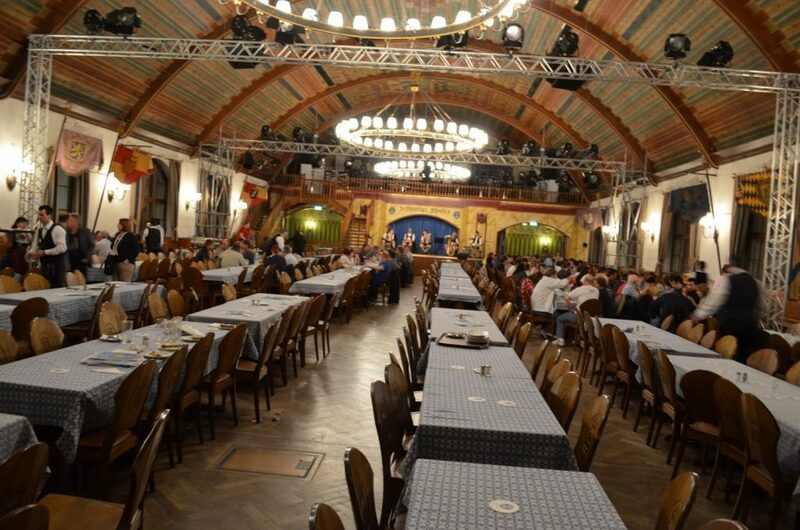 The Hofbräuhaus is made for a night of fun, even if you are not a beer drinker. There are traditional bands, dressed in traditional clothes entertaining on a nightly basis. There are bar maids caring seven or eight, or even more, liters of beer to tables of rowdy Germans and tourists alike. All in all, if you have the time to slow down, this is a good place to do it whether it is warm outside or cold outside, the Hofbräuhaus is always hopping. This royal beer hall was originally built in 1589. Most of the building was destroyed during World War II but was restored and reopened in 1958. Wander through the rooms and enjoy the ceiling frescoes. On a clear day you can see forever. 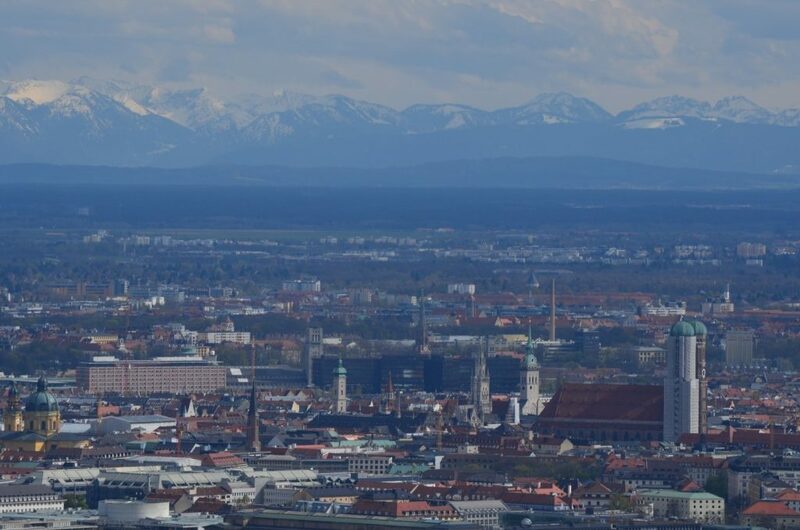 If it is a clear day in Munich, you need to go out to the Olympic Grounds and take a trip to the top of the Olympic Tower. The views from here cannot be beaten. From the Alps in the distance, back to the heart of Munich, to the countryside, the wrap around views are worth the price of the ticket to ride an elevator to the top. This sight gives you an overview of Munich that is helpful when trying to understand where in Germany Munich sits. Look down on the soccer stadium, look across the street at the Olympic Village where the drama of the Israeli hostage crisis took place during the 1972 Olympics, or look across and down on the BMW International Corporate headquarters. This tower’s observation platform sits at 190 meters above the ground. That is over 600 feet high. Bring your sense of adventure and your camera. If you are in Munich at the right time, the last week or so of September and the first few days of October, I highly recommend you attend Octoberfest. 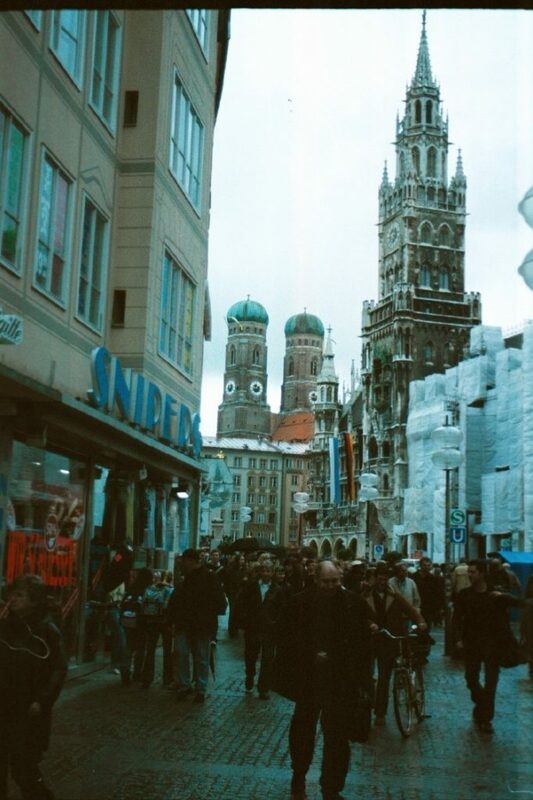 In fact, I recommend you travel to Munich during Octoberfest, it is that much fun. Even if you do not drink beer Octoberfest is a must see. There are carnival rides that will scare you out of your wits. There are displays to be seen. There is food to be eaten. And there are beer tents set up by all the local breweries that are unparalleled in this world. 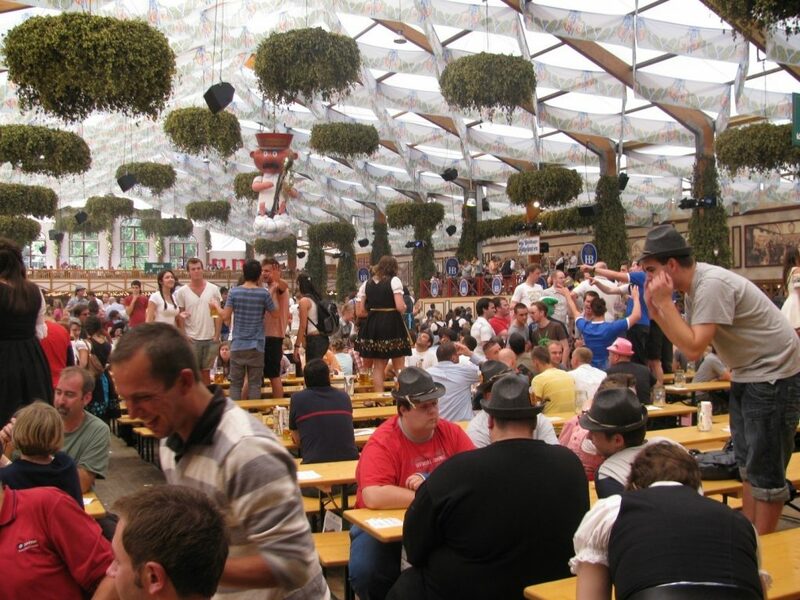 These huge tents bring the beer halls of Germany to Octoberfest. They bring the party to the people. Originally, Octoberfest first occurred when King Ludwig I was getting married in the early 1800s. It was first a horse race, but it was designed to allow the commoners to take part in the King’s wedding. From there it has grown into an event that each year sees over 6 million visitors come to Munich to participate. They serve 7.5 million liters of beer, 127 oxen, and 59 calves. Obviously, this is not all there is to do in Munich, but it will get you started. Munich is a city that needs to be explored and thus made to be your own. You still have countless museums, Asam Church, Englischer Gartens, amongst other noteworthy sights to see.